How to create a fail safe outfit for an evening out....could I ask a favour please? On Saturday night I was out at the Edward's Trust Ball. Edward's Trust is a fantastic charity which provides a wide range of support services to bereaved families and children. They don't receive any government funding despite the NHS referring children, so they really rely on charitable donations. I've previously been to the Edward's Trust Garden Party where I saw an exhibition of the artwork done by children who had lost a parent. There were pictures painted both prior to, and having received, the support of Edward's Trust and there was no better way to demonstrate the impact that the work of ET has. Even thinking about those pictures makes me want to cry. But being a snivelling wreck doesn't help anyone does it? However running a half marathon for Edward's Trust hopefully will. So on Sunday 18th October, that is what I shall be doing - running the Birmingham half marathon for Edward's Trust. As with most events these days, I prefer a slightly more dressed up/dressed down look - mostly because I find it warmer and more comfortable. So this is the look that I opted for on Saturday night and how I went about creating it. 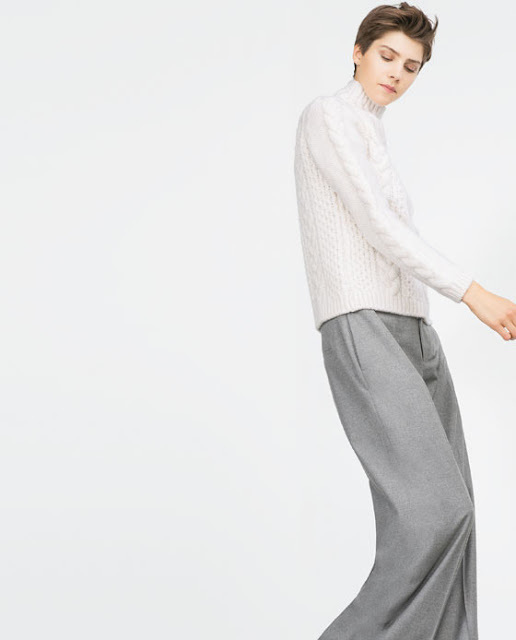 I love my silky track pants from Topshop and Boden has a great pair this season, which you can see here (£69 but currently in the sale for £60.03). 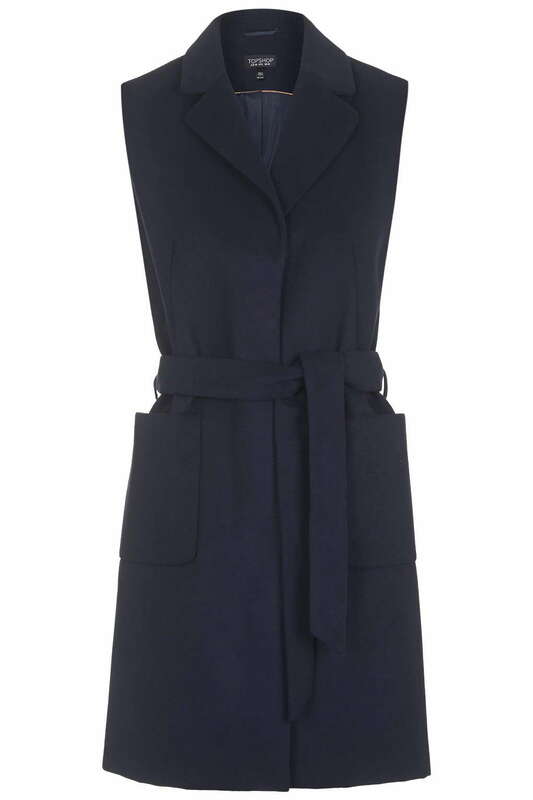 The reviews are actually very, very positive for Bodenites and I am tempted with the navy. Because of course we all need about 10 pairs of navy trousers in our wardrobes don't we? For anyone looking for a slightly different style of trousers, joggers - ignore the term, it conjures up images of 1980's style shell suits and headbands - are a great place to start. They are versatile and flattering both with flats and heels, blazers, biker jackets and long coats. And not many trousers can make that claim! 2. Take one top with enough coverage to keep warm (yes there was a vest underneath, albeit silky and black) but which has enough about it so as not to look like a t-shirt or a work top! I also wore a brocade top from Miss Selfridge which I bought last winter, just before Christmas. I've checked and I can't see anything similar at the moment but leave it with me and I'll see what I can come up with. 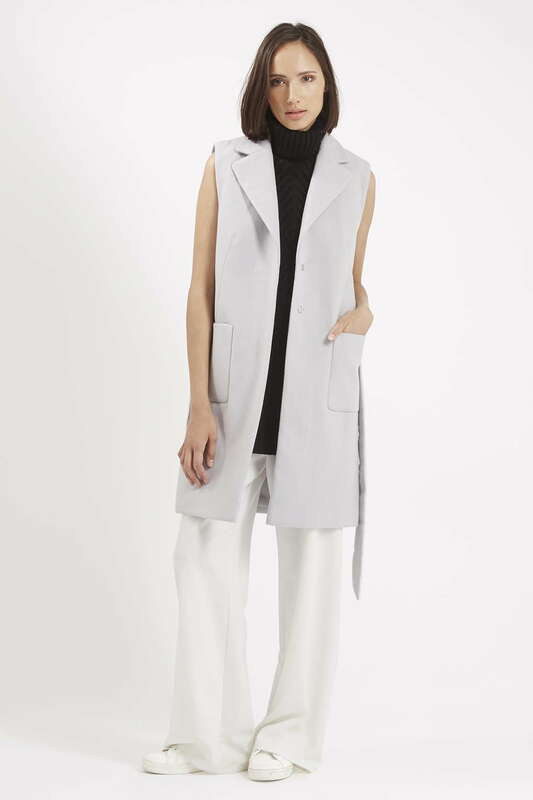 In the meantime, Jigsaw has this cropped top (£79) which (I think) would be the perfect length with these trousers. It's not really cropped in the sense that we think of cropped, rather just waist length as opposed to hip length or below. It sold out in ivory in the summer so it's good to see it back in stock. It would be great with a big statement necklace to make it slightly dressier and it would also work with anything which has a slightly higher waistband, such as a pleated skirt. 3. Add a pair of heels- go a high as you can! As for shoes, I ordered these from the Karen Millen sale after Christmas for £40 instead of £140. It was the first time that I wore them and they were really comfortable. High, but comfortable! They are currently on the site for £90. I would be tempted to ring Bicester! 4. 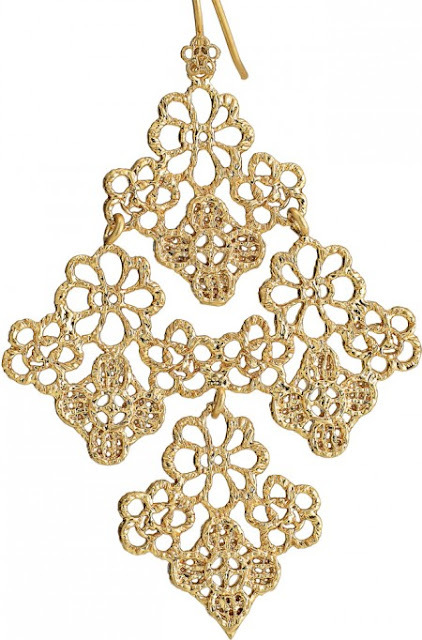 Stick on a pair of chandelier ear-rings from Stella & Dot (£40) - and Bob's your uncle. The only problem is, I don't have a gold watch. So that's my Christmas pressie sorted, which Mr SG is pretty happy about. I have to apologise for the photo. My photographer thinks that every other photo should be of her so she flips the screen without me knowing to take a photo of herself. This leaves me with half of the photos that I would normally get. And believe me, I need more than two to choose from. We all know that I've been wittering on about buying a fringed bag for a while now and finally I found one that I liked with reference to price, colour and the amount of fringing that it had on it. I'm a bit of tinker when I get a new bag and I just use it non-stop, which is what I've done over the weekend. 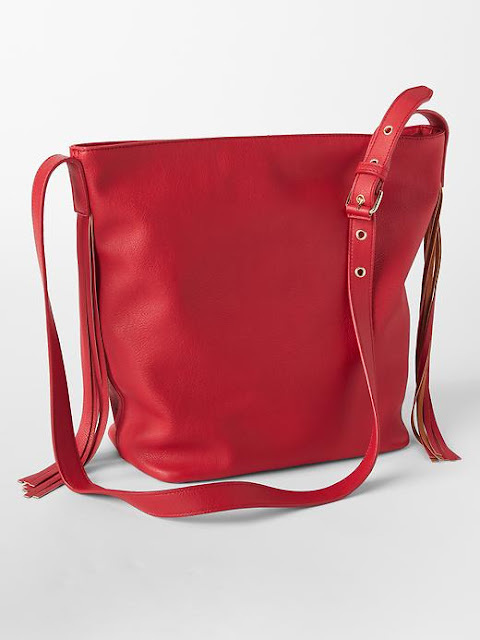 But I do love a red bag, especially if it's a red bag that I can wear across my body and even more so if it's a good price and with a tassel or two. So, here's a picture of the GAP tassel bag (showing as £32.95 online but I paid £14.95 for mine in store). You can see it much better in my new vlog, which is available to watch here. 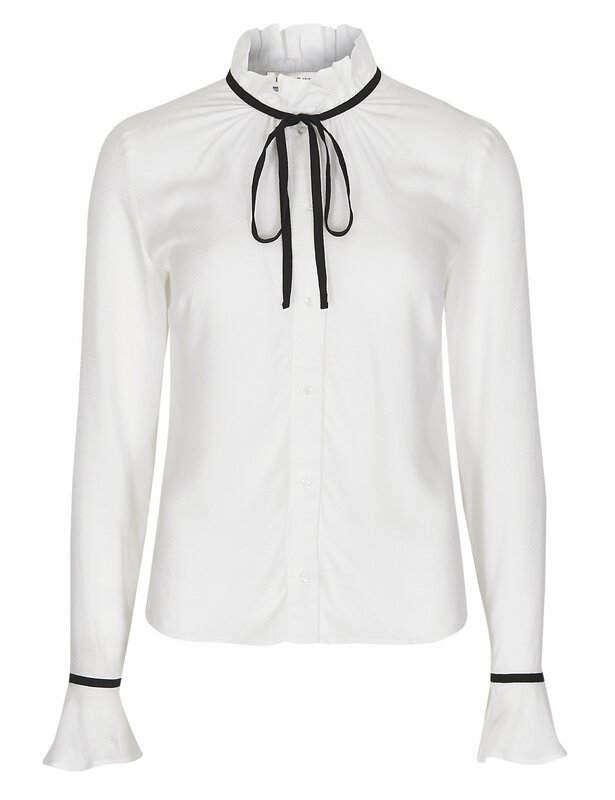 In the vlog I'm wearing this M&S tie neck blouse (£29.50) which can be seen much more clearly than when I wore it underneath the dungarees in my last vlog. Why don't you give it the good once over to see what you think?! Plus there's a surprise Zara top on the vlog which has tassels (and a mind) all of its own - but unfortunately once again, no link. Sorry! I do hope that you enjoy the vlog. As well as fringing, there's a little bit of a fringe chat going on too. What do you all think to VB's new fringe? I have a little something to share with you about it! How to wear....dungarees! Oh yes, I've finally gone there. Why don't you come with me and see what you think?! So having said in my last vlog that I didn't feel comfortable wearing dungarees, I decided that it was time to plunge head on in and give them a whirl. In my new vlog, I've styled them in three different ways - do take a look and see what you think! All this blogging/vlogging business is quite techy for someone like me so please bear with me whilst I sort out all the links. I've linked to the pieces that are currently available to buy in store, below. I've also included links in the "description" box on the vlog - but I'm not sure whether you can click through from them - although I'm about to find out! Yesterday I had to buy an umbrella. And why did I have to do that? Well, I insisted on walking to school without (in my defence) realising that the heavens were going to open. But they did - big style - and I had three choices a) to wait until lunchtime for the rain to stop before walking home (tempting but lurking in the doorway of our local M&S for three plus hours probably wouldn't have been a good look) b) to get my new Oasis coat soaked (not flippin' likely) c) to buy an umbrella. Or as my friend pointed out, there was an option d) which would have been to get a cab - and in fairness this would have been cheaper. Anyway the youngest thought that it was highly amusing and that it served me right for making her walk/scooter to school. She'll thank me when she's older. Actually scrap that, who ever thanks their parents for making them walk to school? They just torture them with the fact, making them feel guilty at family gatherings. When I'm dressing for the school run - as opposed to the school "drive" I always work from the ground upwards. Adidas trainers, new Whistles high rise skinny jeans (bad move on a Monday morning - breathing is actually quite necessary in life, or rather, for life), silk shirt, one of my favourite slogan jumpers (New Look special last winter) and my new coat - which created a whole little story of its own. 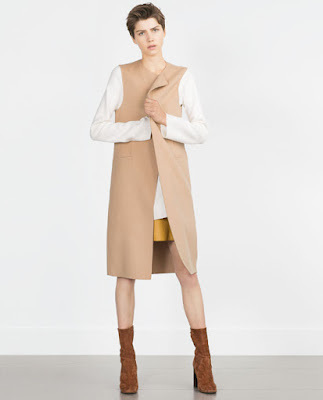 Capes, ponchos, sleeveless coats - I'm trying to get as much wear as possible out of the lot of them before the winter sets in and it's thermals and duvet style coats all the way! I'm hoping to follow the vlog with a series of "How to Wear..." vlogs, the first one of which is a work in progress at the moment, so do keep your eyes peeled. If you would like to subscribe to my YouTube channel you can do so by pressing the "subscribe" button on this page which will mean that you will automatically get updated as and when a new vlog appears. And if you think that any of your friends or family would be interested in my musings, please feel free to share the vlogs. Equally if you have any feedback or if there is anything that you would like me to cover, please just drop me a line. I'm also hoping to do a series of "30 second styling tips" too - so we shall see where that takes us! I've definitely come to the conclusion that as we get older we care slightly less what others think - subject to us feeling comfortable and confident, which is something that I cover in the vlog. A few years ago I would never have posted a picture like this. I would have been too scared that someone would say something horrible. Not so much anymore - I've figured that it always says more about the happiness, or otherwise, of the person leaving the comment than it does about anything else. And anyway I have to keep the 7 year old entertained or there will be a revolt. On Instagram people seemed to like this jumper that I was wearing today. Despite the fact that it's a good few years old, it's still available at All Saints (£78). It comes in 6 shades, mostly varying shades of neutrals/greys/black but also in terracotta too. I suppose that you could say that whilst it's on the pricey side, it does have longevity. And if that's not good justification for buying something, I don't know what is! A bit of back detail never goes amiss! Who doesn't love (fake) fur...and stripes....mixed? One to covet, one to consider and one to own! 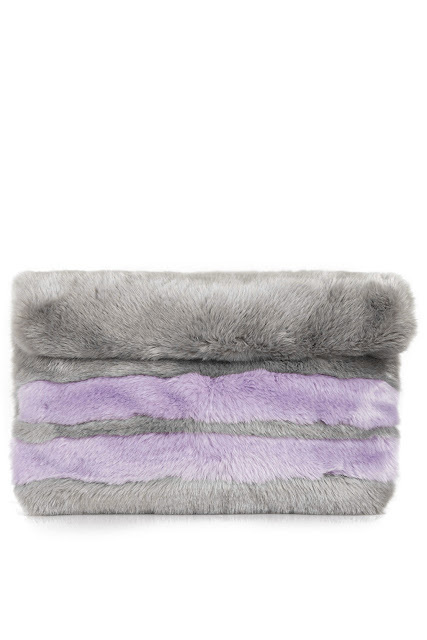 But then when I was in town a day or so ago, I spotted the Topshop fur clutch (£32) and my heart skipped a beat. Which made me realise, it's probably just the idea of stripes and fur that I like, rather than necessarily a striped fur coat. And the possibility of owning something which ticked those boxes just got a whole lot closer. Other peeps out there seem to like striped fur things too. What do you think? (Images courtesy of Pinterest). The second picture brings me on to a whole separate topic of OTK boots. It's taken a while but this year, I think that I might just go there. One day soon I will take these boots off, I promise. But not just yet. When the rain and mud arrive, I shall pop them back in their box but for now they are just perfect for the scooter run to school. I've just posted another vlog (which can be viewed here) in which I'm wearing the cream cropped jumper that I've featured above, plus the cream cable knit jumper which you can see below. I think that I'm a bit jumper obsessed at the moment. There's nothing like being prepared is there?! Sorry, I'm going to have to scoot now. I'm trying to watch Dr Foster on catch up and keep getting distracted from typing. Isn't it fantatic?! Time for a treat - bringing you flowers and a 20% M&S discount. Ladies, it's time to shop!! Who doesn't love flowers? I just adore them - especially when they come ready tied so that all I have to do is put them in a vase of water. So when I was asked by Blossoming Gifts whether I would like to receive a bouquet of flowers in return for writing about them on here, I wasn't going to say no, was I? It gave me an opportunity to not only enjoy them briefly myself but also to hand them on to a lovely friend of mine, who I knew would love and appreciate them too. Blossoming Gifts is a brand new UK based flower delivery company specialising in beautiful flowers at a low price. I'm always intrigued by new companies, mostly because I'm nosey and I like to see how they compare with those who currently dominate the market. Interestingly there is a range of cheap flowers for under £20 and it is possible to search the website by flower, by occasion plus there is also a wide selection of personalised gifts, hampers and wine. I chose the beautiful Sky bouquet which was made up of oriental lilies, roses, agapanthus and greenbell - but it was a difficult choice to make because the choice is so extensive. Blossoming Gifts have a lovely selection of flowers by post* and as a thank you to me, and to you for reading this post, they are offering a fantastic 33% discount offer which is available using the code BGIFTS33. And whilst we're on the subject of discounts, as an M&S cardholder I get certain discounts as do my "Friends and Family". Well that has to include everyone who reads this doesn't it? So for anyone who would like to buy anything from M&S which falls under the category of "clothing, beauty, home and furniture" between 17th and 21st September, if you quote code SEP15A12 online, you can get 20% off. Go shop with glee!! *The flowers by post range is excluded from the 33% discount - but it is only very small! A winter wardrobe essential - the chunky of chunkiest cardigans, a lovely boho dress and a vlog so that you can see it all in the flesh! With its slightly chillier mornings, September is the perfect time of year to wear a chunky cardigan - rather than a coat. This is one that I picked up in Zara last week (£39.99) which isn't on line quite yet. However fear not, it features in this new vlog post where you can get a closer look at it, plus ideas on where to find other similar cardigans together with ideas on how to style them. Boho dresses are a huge trend this season. There's a Monsoon one which is currently getting a lot of coverage but for something which is nodding towards the boho trend without being too full on, there's this Zara printed dress (£39.99) which also features on the vlog along with the cardigan. I really hope that you like this vlog. I've tried to include a couple of good styling tips as well as showing the clothes (on me....eeeek!) so do let me know what you think! 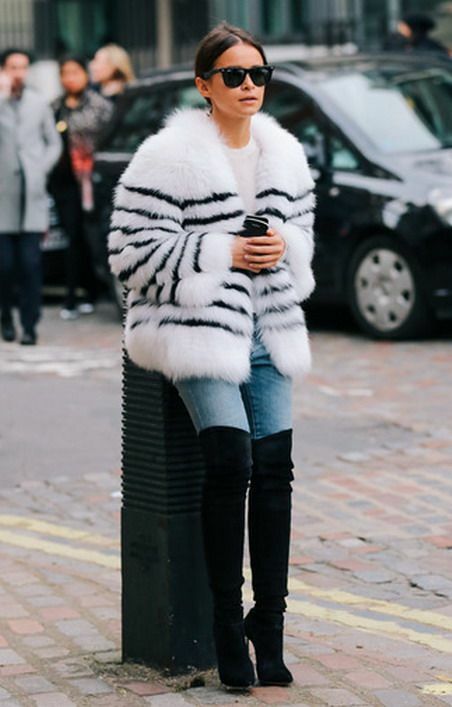 Bring your wardrobe up to date with the ONLY coat of the season (for now at least!) - and there's a not to miss vlog talking you through the options. 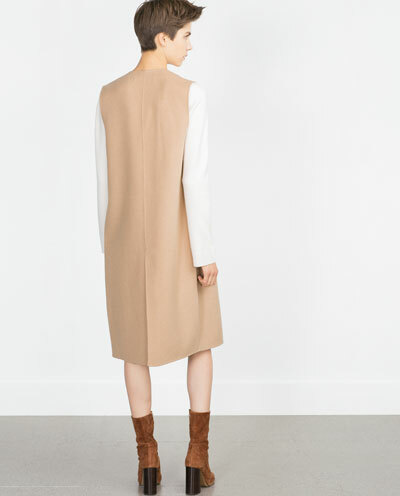 Short sleeved coats are THE coat of the season. They are everywhere in the shops and I just LOVE them. They are great at this time of year. You can flash a bit of lace as I've done above, rock a stripe, bring out some denim, show off some print - it just makes them so interesting and fun. In the above shot, I'm wearing the Lexi short sleeved coat from Oasis (£65) which you can see in my latest vlog here where I talk about sleeveless coats and the options currently available on the high street. The Topshop sleeveless coat in navy (£50) is another of my favourites and it's also covered in the vlog. Navy is always elegant and the lines of these coats are just so simple and stylish. 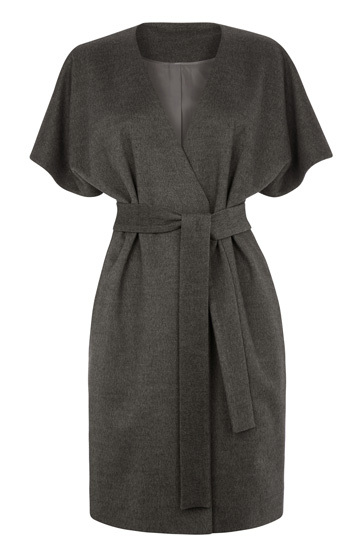 This coat is a great price and a lovely fabric, so definitely one to watch. Again I've covered it in detail on the vlog. The Topshop sleeveless coat above also comes in pale grey (£50). With wide legged trousers and trainers it looks amazing. So simple and yet so effective. 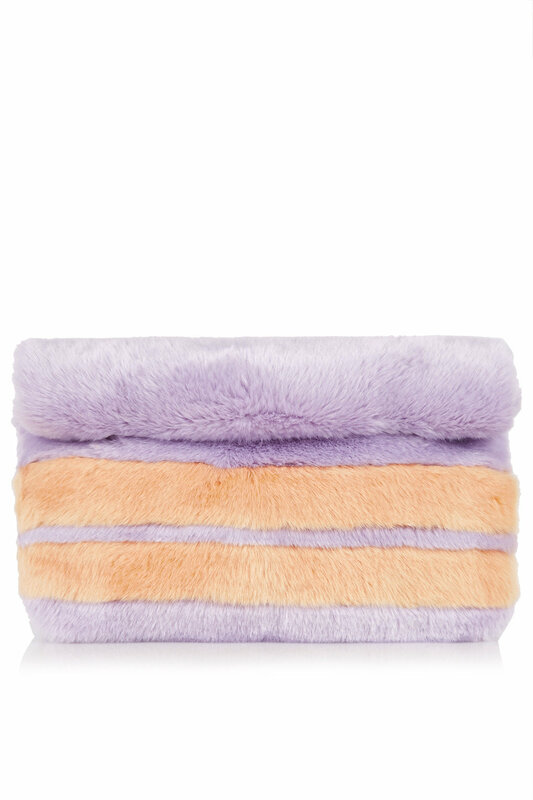 It's the perfect one off investment to bring your wardrobe bag up to date for the season. It will work so hard for you and my guess is that it will do a fab job of pulling lots of different pieces together - jeans and a jumper, skirts and a blouse, a dress - the options are endless. I've also included in the vlog a sleeveless cardigan from Autograph at Marks and Spencer which isn't currently available on line and here is a Zara camel sleeveless coat (£79.99) that I came across after I filmed the vlog. This is definitely next on my list! Or in fact any camel coat for that matter! But that's a whole new blog post. Lace Skirts - for now, for the winter, and forever! I love a bit of lace. Top or bottom, it can just make you feel just a little bit more special than an "every day" type of fabric such as denim. I bought this lace skirt from Jigsaw way back at the start of the summer and it's now in the sale for £79, with pretty good availability too, being available in sizes 8/10/14. Although technically it's a summer skirt, it is substantial enough for me to keep in my wardrobe for a few more weeks yet and perhaps right through the winter. 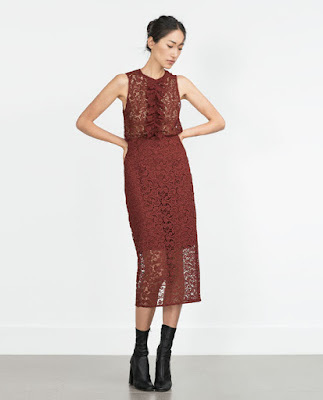 Secondly I spotted this lace pencil skirt, also from Zara (£39.99), which is in THE colour of the season....burgundy. It's great that is has a top to go with it, making a whole outfit should the need arise. 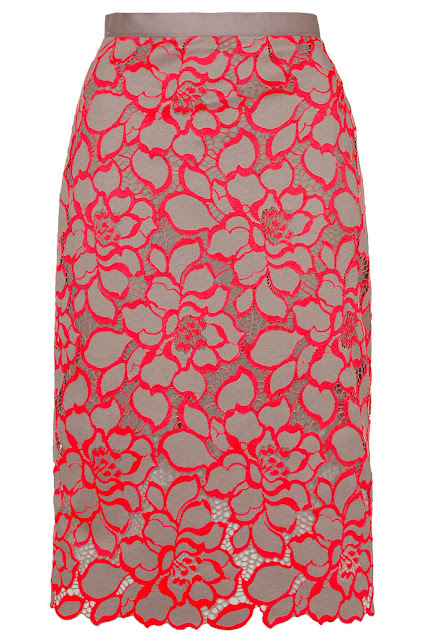 Marks and Spencer has this lace skirt in Autograph for £55. It's a little bit less "fashiony" than the Zara ones and arguably slightly easier to style mostly because of its knee length which is, as a general rule, more flattering and easier to wear than midi-length skirts - particularly with flats. There's also this gorgeous fluorescent lace pencil skirt from Topshop (£65) which is lovely and vibrant for the winter months plus the taupe background makes a nice change from the usual suspects of black/navy/grey/burgundy. 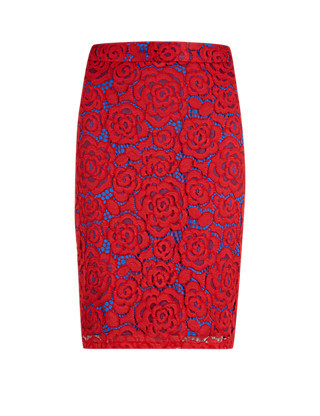 And for the petite ladies amongst you, M&S has kindly obliged and designed this lovely Rose Lace Pencil skirt, which is £39.50. 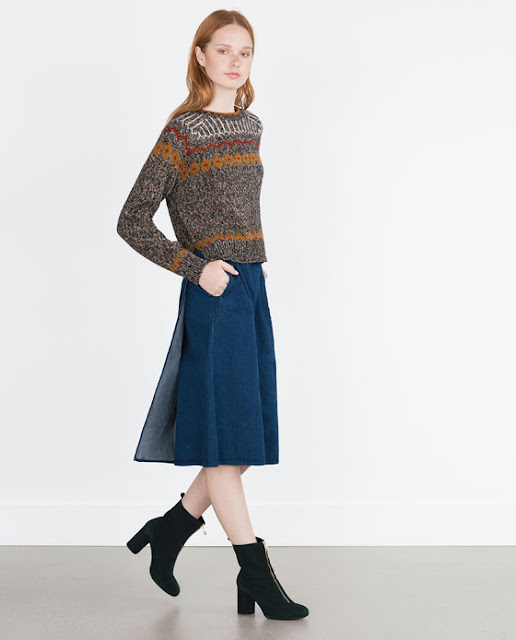 Please someone put me out of my misery and tell me that I'm not going mad when I say that I'm sure that I saw a navy blue lace skirt very similar to mine in Whistles yesterday. I'm convinced that I did. Didn't I? I would like to say a huge thank you to everyone who has watched the YouTube vlogs. Thank you for your views, for subscribing and for your comments. Also a big thanks to Helen for the lovely comment on the blog yesterday with pointers on things to cover. All I can say is, don't go out and buy a sleeveless coat before watching the next vlog! 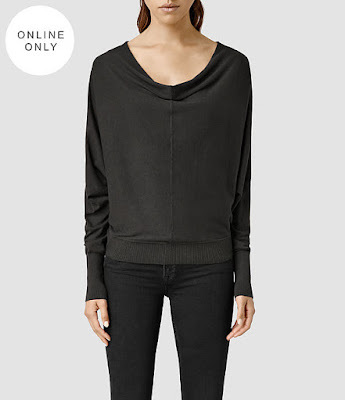 For the life of me I cannot find this top anywhere on the Zara website (despite about 250 searches) but I only bought it yesterday so it should be there somewhere. I know that lots of us love a good stripe and I like how this top is half way between a long sleeved cotton top and a jumper, making it perfect for this time of year. This was my other fab find of the day, a long sleeved cropped top from Topshop for £12. If you would like to find out more about both of these items and find out why the Topshop top is my new best friend, you can nip over to my new vlog here for more info. It may be starting to get slightly chillier out there but that's no reason to reach for the knee high boots and roll necks just yet. Nope, there are plenty of ways that we can extend the life of our summer clothes. I thought that I would have a little play around and here I'm wearing my & Other Stories midi length summer dress which I first wore way back in sunny June, with my current favourite Zara jumper and Jigsaw ankle boots. I think that the longevity of this outfit is limited perhaps to the end of the month but the winter can be long! Last year I just remember being sick to death of jeans and jumpers so I'm happy to avoid going there for as long as I possibly can. One tip for this type of outfit is to get the right length jumper. Something that finishes just on, or above, the waist seems to be about right so as to keep the lines right and also to keep everything in proportion. Do you have any ideas for stretching out those summer clothes? I would love to here them. Layering either over or under things, switching footwear, sneaky thermals in September? I'm open to suggestions! Neutrals and how to wear them if, as a rule, they don't really like you that much! Today's post is just a quick OOTD. Generally I don't wear too many outfits made up entirely of neutrals. Many neutrals just seem to wash me out and I'm better with colours which have some depth to them, just as you might expect given my dark colouring. However I really like this Boden cardi/jacket that I bought in the sale last year (similar here) and it seems to work OK with this & Other Stories printed blouse (similar (ish) here (£45). It's all quite soft and muted but I think :) that I can just about get away with it. A bit of colour from the sun probably doesn't harm either. I carried on the "light" theme with some white Whistles jeans and pale suede Jigsaw ankle boots (available here in a size 36) - but then stuck a navy Whistles bag with it all, in all probability just because it was handy. On this particular day I needed a little warmth but I didn't want to head straight for the winter pile of clothing. Nope, for now I'm hanging on to those lighter shades for dear life. Re-visiting our ribbing chat - and putting vlog no. 2 out there! Some of you may remember that a few posts ago I wrote about ribbed clothing and how much it features on the High Street this season. In this post I'm featuring a whole outfit which is ribbed and which I bought from Autograph at Marks and Spencer a few weeks ago. These two pieces were featured in Vogue so unsurprisingly they are not now available on line but I suspect that they may still be carrying stock in store. For some reason this outfit reminds me of Friday nights watching Friends back in the 1990's - boot cut trousers, longer line jumper - we've been there before but I don't think that this means that we can't go there again! In my second vlog, which you can watch here I'm talking about this two piece together with Topshop jumper and Marks and Spencer ribbed dress. I would love it if you could head over to see what you think! And as is only fit for a 1990's inspired outfit, here I am doing my best Spice Girls pose. Anything to keep the photographer happy! Zara wrap around denim skirt - and introducing the Style Guile vlog! 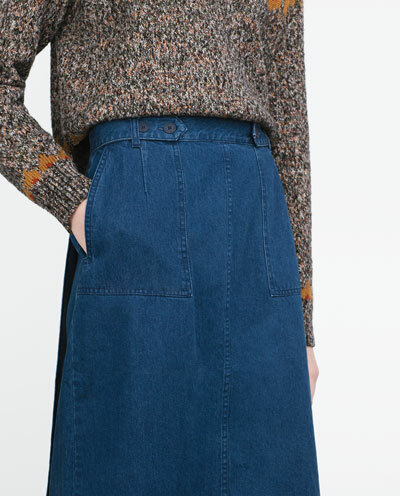 Last week I had a couple of hours to myself so I nipped to Zara and, amongst other things, I came away with this Zara wrap around denim skirt (£25.99). I LOVE denim skirts. 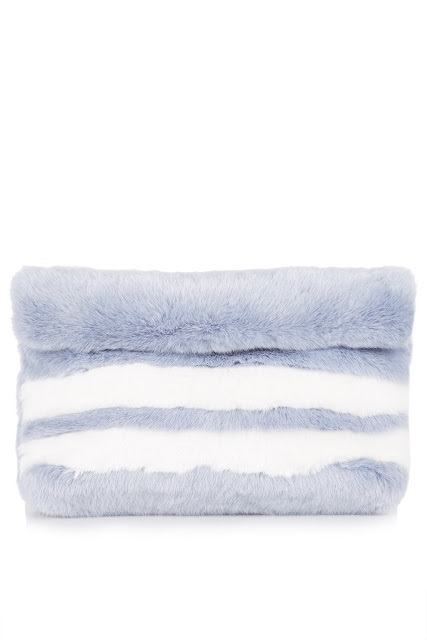 They are so perfect for this time of year, especially midi-length ones because you can still show a little leg whilst at the same time keeping warm. For anyone who would like to see the skirt in the flesh, together with a more detailed review of it and another denim skirt from Zara, you can head over to my first vlog, which you can see on You Tube here. Vlogging is a bit of a new venture for me so I would love it if you could head over and take a look. The vlog is only five minutes long but hopefully people will find it a little bit useful. I am hoping to vlog two to three times a week, covering all sorts of things from High Street finds, to beauty buys, trends for the season and styling hints and tricks. Really it's an extension of Style Guile but I can cover so much more in five minutes chatting than in five minutes writing!